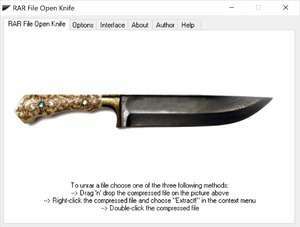 RAR File Open Knife is a RAR extraction utility which only works with RAR files. Apparently it is much faster to use this decompression tool because because it specializes in only one thing: RAR files. While the user interface of RAR File Open Knife isn't the nicest on the block, it is definitely very easy to use thanks to its drag-and-drop compatibility. There are two ways to extract RAR files. Version 7.0 is a freeware program which does not have restrictions and it's free so it doesn't cost anything. For security reasons, you should also check out the RAR File Open Knife download at LO4D.com which includes virus and malware tests. Additional screenshots of this application download may be available, too. RAR File Open Knife has a presence on social networks.